Most people don’t often think about their feet and have a poor relationship with them thinking of them as oddly shaped smelly things on the end of their legs. However, our feet are our mode of transport and we should look after and give them some respect. Foot and ankle care is important, I love to give mine a good scrub at the end of the day and then massage almond oil into them. This helps to nourish the nails and skin keeping my feet supple. Though the practise of yoga, we can keep also our feet healthy, flexible and strong. While we are on the subject of feet, it is worth mentioning that there is an emerging scientific study on the benefits of grounding, what I mean by grounding is standing upon the earth with bare feet. This is because mother earth is endowed with electrons and when our feet are in contact with the earth, these electrons are absorbed through the soles of our feet. Due to our modern lifestyles, we have disconnected from the earth, this is because of us wearing shoes and walking on man made materials such as concrete and other flooring materials and living and working in buildings. We have closeted ourselves away from the very thing that is natural to us. 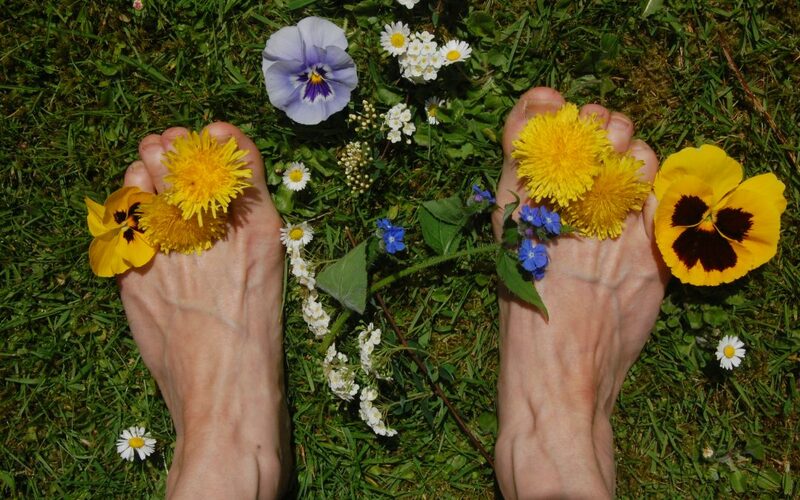 By reconnecting with the earth through our bare feet, we receive those vital earthly electrons which have been proven to reduce stress, improve organ function, promote better sleep and reduce inflammation in the body. Another thing to think about is being outside in nature improves lung function too! So now the warm weather has come, get yourself and your kids outside and walk upon the earth, even if it’s in your own garden. Here is a little practise for you that will help you with grounding; take yourself out into nature and take your shoes off. Stand in Tadasana with feet hip width apart, feel the weight of your feet upon the earth, keep your knees soft and your pelvis in neutral. Contract your pelvic floor slightly, lift your sternum up slightly and lightly tuck your chin so that it is parallel to the earth. Breath into your lungs and feel the gentle rise and fall of your abdomen. Notice how calm and still you become in this posture, feel the gentle breeze across your face. Become still as the mountain, enjoy!! A really interesting blog – grounding is so important. Thank you Pip. Grounding is very important in everyday life. Thank you Pip.